(BRANTFORD, ON – October 11, 2011) – The publishers of the Advocate in Brantford are pleased to announce that the publication has been named as a finalist for a Shining Star Tourism Award in the Promotion and Marketing category for Brand Identity. The Advocate debuted in the community on September 1st of this year and, since that time, has been very well received by the people of Brantford, Brant, Six Nations and New Credit. The publication is already in over 150 locations in those communities, and has been read in cities across Canada. The Advocate features stories from a faculty of community-minded citizens from throughout Brantford, Brant County, Six Nations, and New Credit. Each month, stories are generated from a faculty of writers from across the community. 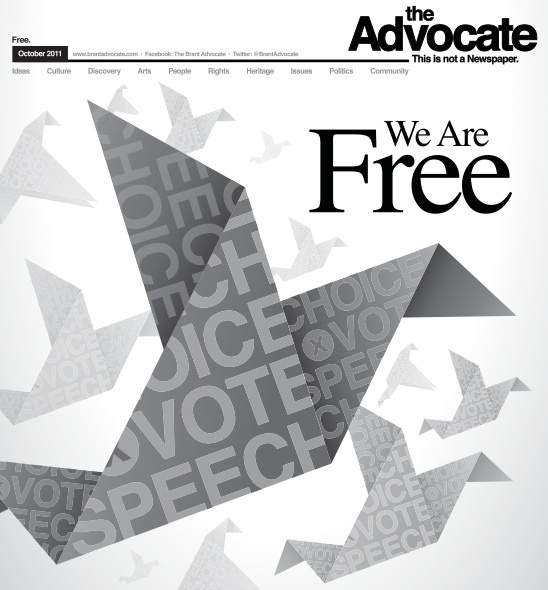 The Advocate looks to them to talk to the community about what is important; the people and stories that the community feels need to be spoken for. The Shining Star Tourism awards take place on Thursday, October 13th at the Sanderson Centre for the Performing Arts in Brantford. For more information, contact Tourism Brantford at 519-751-9900.